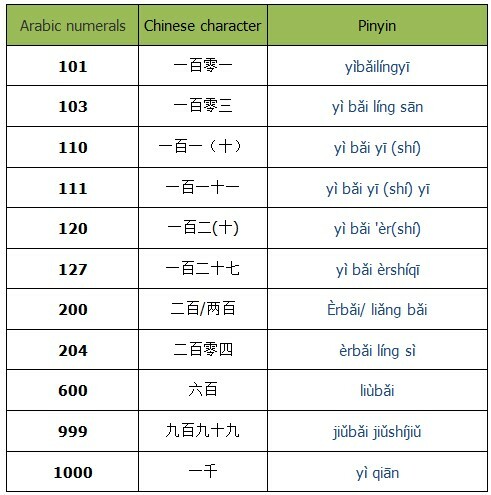 The Chinese counting system is fairly logical, and while it does have some special parts, once you learn it, you will know how to count in Chinese. 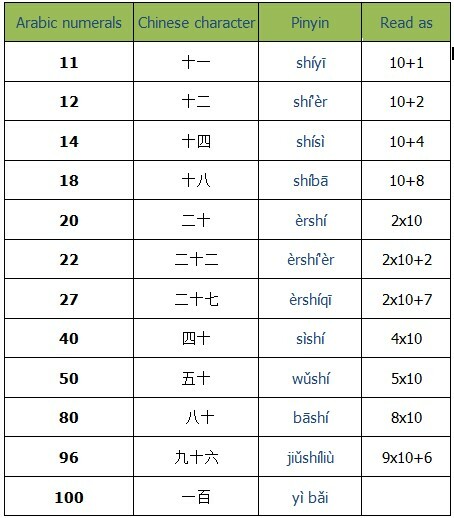 Notes: From 11-19, they’re formed with 十(shí, ten) followed by a digit: 11in Chinese read as ” shíyī “. 12 is ” shí’èr “, and so on. For multiples of ten, the multiplier precedes 十 (shí,“ten”). 20 then is 二十 (èrshí, that is 2×10); 30 is 三十 (sānshí, that is 3×10)and so on. 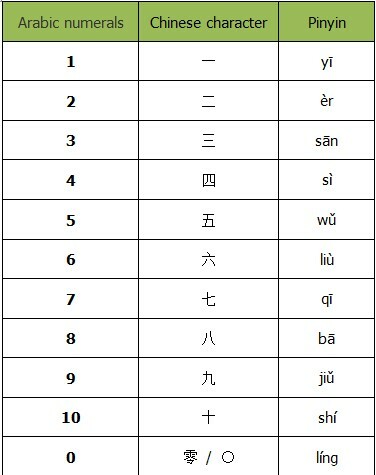 In compound numbers, units are added to the tens, so 12 is 十二 (shí’ér, that is 10+2); 16 is 十六 (shíliù, , that is 10+6), 89 is八十九(bāshíjiǔ, that is 80+9)etc. And 100 is simply 一百(yì bǎi). Note: A zero is pronounced or written when sandwiched by two digits: 608 is Liùbǎi líng bā. Notes: 6080 is Liùqiān líng bāshí. Notice the last zero in 6080 is not pronounced because it is not between two other digits. If there are two or more zeroes in succession between two non-zero digits, as in 1006, only one is pronounced: Yì qiān líng liù. However, if the two or more zeroes are separate and also sandwiched, as in 60,802, each is read as normal: Liù wàn líng bābǎi líng èr. 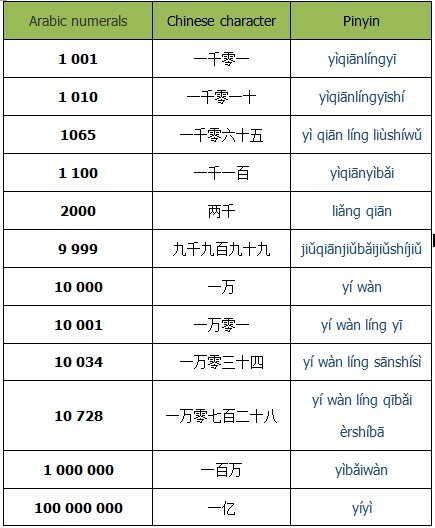 Sometimes a variant of “2” is used in the hundred-million, ten-thousand, thousand, or hundreds place: 两(liǎng).for example:200（两百, liǎng bǎi）、2000（两千, liǎng qiān）、20000（两万, liǎng wàn）、2000000（两百万, liǎng bǎi wàn）etc. It is never used in the tens place. Sometimes when used as an amount it can also replace two alone. 16,000 in English reads “sixteen thousand”, Split it the Chinese way, “1,6000,” and the Chinese reading “一万六千” (yí wàn liùqiān). (8 in the place means 8 million, namely 八百万; 3 means 3 hundred thousand, namely 三十万; 6 means 六万; 1 means 1千; 2 means 二百; 6 namely六十; 9 namely九.) So it read as: 八（bā）百(bǎi)三（sān）十（shí）六（liù）万（wàn）一（yì）千（qiān）二（èr）百（bǎi）六（liù）十（shí）九（jiǔ）. At first sight of the number, you have got to know 9 in the place means 9 million, namely 九百万, because the place in a number is ten times greater than the value of the place to the number’s right. So the 3 in the place means 10 million, namely 3 千万. And the 1 in the place means 1 hundred million, that is 1亿. Now read out each number’s value in each place from left to right. It’s 一亿三千九百七十六万(yí yì sānqiān jiǔbǎi qīshíliù wàn). Normally we do not say large numbers very often, but the numbers below are related to China, which you may want to know.